This salad reminds me of summer. It’s a perfect side for burgers or any BBQ as it’s light and refreshing. My Dad always grew a really large garden and come mid-summer, the cucumbers were out of control, so we looked for any possible use for cucumbers. This was my favorite way to use up those fresh cucumbers, my Mom made something similar (though I never saw her measure anything). I’ve added dill for a fresh twist. Plus, it doesn’t get any easier than this and you can’t mess it up. Add extra mayo if you want a thicker base, or less if you want it lighter. If you don’t have red wine vinegar on hand, I’m sure that apple cider vinegar, or some other variety would work as well. Let me know if you try something else that hits the spot! For your next picnic or family BBQ gathering, whip this up and I promise you won’t have any complaints! In a medium sized bowl, whisk the mayo, vinegar, dill, salt, and pepper. Peal your cucumbers and slice open long ways. Take your knife and score the perimeter of the seeds and scoop out with a spoon or your fingers. 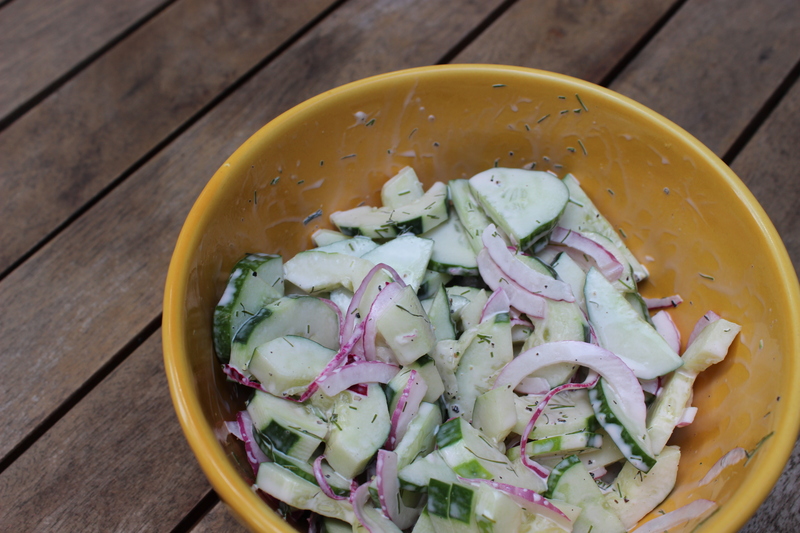 Slice the cucumber into approximately ¼” slices and add to the bowl with the sauce. Slice a red onion in half (from the stock end) and peal the outer layer. Slice very thin until you have approx. ¼ cup and add to the bowl with the sauce. Toss the cucumber and onion in the sauce until evenly coated.